Our modern lives revolve almost entirely around our phones and we’re still trying to figure out the effects of this new, connected, mobile existence. Researchers have been looking into how our frequent cell phone use affects our brains, our morality, and our privacy. We look down a lot these days. I’m doing it right now as I type this on my laptop, as are the five other writers surrounding me. This is a surprisingly big problem. You probably don’t notice it, but the head is actually quite a heavy part of your body – about a dozen pounds on average. 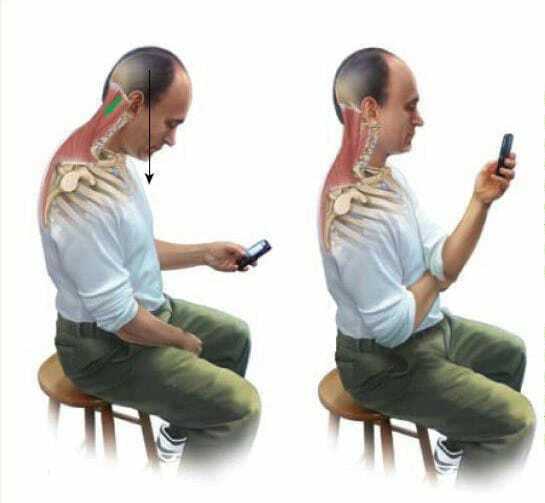 The load it puts on your cervical spine – that’s the upper part – gets worse the more you bend your neck forwards and down, like you would when you check your phone. At a 15-degree angle, the load becomes about 27 pounds, and it gets worse as you expand your downward movement, with a maximum of 60 pounds at the same number degrees. A bit of this extra weight isn’t such an issue, but it becomes one when you consider how often we use our phones. On average, smartphone users spend two to four hours a day on their devices. That averages out to 700-1,400 hours a year, with a possible extra 5,000-per-year for high school students who are even more prone to reliance on their phones. Considering that the majority of American citizens own smartphones – 58 percent and growing, based on a study by the Pew Internet Project – the problem is widespread enough for Hansraj to refer to it, with a bit of hyperbole, as an epidemic. These effects of text-neck are manifold. At its most mild, the extra stress on the neck just causes some inflammation and soreness. But after a prolonged amount of time, it can cause muscle strain, pinched nerves, and displacement of spinal disks; it can even get so bad as to remove the natural curve of the neck. Besides these spinal injuries being harmful in their own right, problems with one’s posture can also reduce lung capacity and has been linked to neurological issues, depression, and heart disease. The lesson here is simple – stop looking at your phone, or at least cut back. Call your friends and have a real conversation. Go out and do things rather than reading about them on Reddit. And for crying out loud, look forward instead of looking down for once.